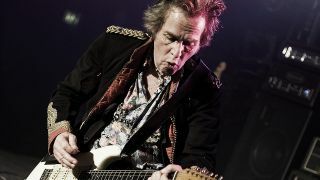 A fundraising website has been set up in memory of Bernie Tormé who died earlier this month at the age of 66. The former Ozzy Osbourne and Gillan guitarist was rushed to London’s St Thomas’ Hospital in mid-February suffering from virulent pneumonia in both of his lungs. The musician was placed on a ventilator but passed away at the beginning of last week. Bernie’s family have set up the site lieu of flowers being sent to the guitarist’s funeral, with the money raised going to the Guy’s And St Thomas’ hospitals. In addition, Bernie’s family have issued a statement thanking fans for their support. They say: “The family would like to extend their thanks and gratitude for all the kind words and comments since Bernie’s untimely passing. Ozzy, who recruited Tormé for a handful of live shows in 1982 following the death of Randy Rhoads, was one of the first to pay his respects to the guitarist on social media last week. To make a donation to the fund, visit the new website.